ACR-GNY - Roundtable Breakfast - HOW DOES IT FEEL TO BE A PROBLEM? Roundtable Breakfast - HOW DOES IT FEEL TO BE A PROBLEM? Just over a century ago, W.E.B. Du Bois posed a provocative question in his classic The Souls of Black Folk: How does it feel to be a problem? Now, Moustafa Bayoumi asks the same question about a new "problem" group in the United States and relies on seven young Arab Americans to provide the answer. In his book, Bayoumi presents striking portraits of the newest population to be tagged "problematic," 20-something Arab-Americans in Brooklyn. These young people face surveillance and detentions, workplace discrimination, threats of vigilante violence, and the disappearance of friends or family. Bayoumi will reflect on what it means to be Arab-American and Muslim-American today, 10 years after the terrorist attacks of 9/11. 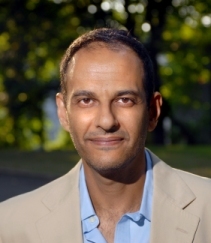 Moustafa Bayoumi is the author of How Does It Feel To Be a Problem? : Being Young and Arab in America (Penguin), which won an American Book Award and the Arab American Book Award for Non-Fiction. (The book has also been translated into Arabic by Arab Scientific Publishers.) His writing has appeared in The New York Times Magazine, New York Magazine, The Guardian, The National, CNN.com, The London Review of Books, The Nation, and other places. Bayoumi is also the co-editor of The Edward Said Reader (Vintage) and editor of Midnight on Mavi Marmara: the Attack on the Gaza Freedom Flotilla and How It Changed the Course of the Israel/Palestine Conflict (O/R Books & Haymarket Books). He has been featured in The Wall Street Journal, The Chicago Sun-Times, and on CNN, FOX News, Book TV, National Public Radio, and many other media outlets from around the world. Bayoumi is a professor of English at Brooklyn College, City University of New York.